I'm very impressed with the wealth of knowledge on this message board but I guess my true love lies on motorcycle racing in the 50s, 60s and 70s. Does anyone know of a comparable motorcycle message board of this quality? I do not but may be we should create one within the Nostalgia Forum? I most definitely agree.....but how does that happen practically , with our hosts etc ??? And so do I. If you're happy with it consisting of threads as opposed to a dedicated domain, then go for it! Oh, and while I think about it - I need to get hold of one of these stickers. Long story, but the one I had I promised to a friend at Ducati and it got lost in the post (no, it really did...) on it's way to Bologna, so I need a replacement. I'd really appreciate any help that's forthcoming. Top dollar paid! Stuart, maybe You could talk to Bira and ask for a sub-forum for that (RC has three- archive, live forum and bets & games))... I'm looking forward to learning about history of bike-racing. I don't know if it's "in line" with the interests of a F1 forum but I think there will definitely be an interest for such a forum! So I really hope there could be one somewhere! You will notice that the picture could be of Tarquinio Provini instead of Giacomo, but the bike is unmistakably the Morini 250 single that oh-so-nearly would have won the worlds in 1964 against the might of Honda and Yamaha, the Suzuki being a big fat 4-cylinder pig at that time. Er, actually I hadn't noticed that Philippe...! Is that the Provini who created Protar models (as in kits)? Indeed. Tarquinio Provini was 250cc world champ on a streamlined Mondial identical to the one that Sammy Miller brought to several of the Festival of Speed meetings. Then he drove for the Commendatore Morini and helped develop this truly extraordinary single-cylinder engine, and the handling of the lightweight and very well streamlined bike. Once he moved to Benelli after nearly winning the world championship, Giacomo was offered the ride and won the contested Italian championship before being signed by Count Agusta to drive the MV quattro pair of 350cc and 500cc. Meanwhile Tarquinio had a go on the 12-speed Kreidler, but even I had more success on the difficult tiddler than he did, as he could not figure out the complex twin shifting gearbox. After he retired he founded Protar (PROvini TARquinio) and the first issued model was the Morini single. It was followed by a Gilera Four, then by the Benelli Four driven by him, then by the unfortunate Renzo Pasolini. Provini was an extraordinary and courageous racer, and anyone who witnessed him driving this Morini was very privileged as he was one of the all-time greats. I agree too. Always thought TNF should cover all motorsports not just cars, especially as Muzza & co are also looking after bike related stuff . Let's open up the forum to the two wheeled crew. Of course this has to be a decision of the forum's owner since this is a private venture. But I for one would love to have two parallel forums, the Auto Racing Nostalgia and Motorcycle racing Nostalgia Forums. Let me kick off with a short post about how I got interested in motorcycling and motorcycle racing. My father always rode motorcycles, usually with lumbering great double-adult sidecars. He later went up market to Bonds and Reliants (ouch!). Born and brought up in Ramsgate on the coast, he often took me in the 1950s to the twice yearly motorcycle sprint organised by the Sunbeam MCC at the Western Undercliff. This type of racing later became drag racing when two bikes (cars) raced against the clock, but on this narrow bumpy concrete track, with chalk cliffs on one side and steel railing protecting the beach on the other, one bike at a time was enough. Castrol 'R', aaah. During the 60s, a fatal crash involving Ian Ashwell (Vincent) at the Brighton Sprint caused the Sunbeam MCC to consider safety even more so that was the end of the Ramsgate Sprint. My first experience of motorcycle racing on a circuit was the inaugural meeting at Brands Hatch in 1960 when motorcycle racing took place on the new GP circuit. My hero became local rider Derek Minter who six weeks earlier had been involved in a tragic crash with Dave Downer at the same circuit - Downer was killed and Minter sustained a broken back, but there he was about to ride again. Minter was a Brands and Oulton Park specialist and was known as the 'King of Brands'. I seem to recall that might have been when Geoff Duke's revived Gileras were also raced. Other riders that day were Mike Hailwood (MV), Phil Read, Bill Ivy (a local lad from Maidstone) and Chris Vincent on a sidecar. For the next few years, I'd make the journey to Brands until the much shorter, and closer, Lydden Hill circuit, opened. Those were the days. Derek Minter was indeed one of the 1960's greats and it is rather too bad that he confined himself mostly the the British short circuits where he excelled. You are correct in recalling the Geoff Duke's Gileras, but these bikes were really not successful except when the prodigee rider from Venezuela, Benedicto Caldarella, drove them, almost humiliating the invincible MV Agusta team and Mike Hailwood in the process. I am ready for a classic bike racing forum at anytime, but as long as it is OK to talk racing bikes on the Nostalgia forum and that it is OK with the forum owner, I think we should. So they were great bikes but pensioned off after the 1957 season. I understand that Duke pleaded with the company to release their bikes and in 1960, they relented. However they needed further development to keep up with the MVs. "Regarding Brands Hatch 1963, Derek Minter won breaking the lap record, the first over 90mph on a motorcycle! Not bad for long-in-the-tooth machines!! John Hartle was 2nd. Best wishes, Geoff Duke". Paul, I agree with you and of course the Gileras were great in their time, there but there was little opposition at Brands other than a cohort of Manxes and G50s. Fact is, Duke was unable to get Gilera to do any engine development and by that time the engines WERE obsolete. But I DO remember Caldarella at the US GP and later in Italy... and the MV opposition WAS present. But I must say that Hartle did win the Dutch TT that year after the MV ran into trouble, and they were not THAT far off the MV's performance. All in all, I believe that Duke was met with lukewarm enthusiasm (and financing) from the Italians, and it is too bad indeed. Lots of financial problems plagued Gilera, Bianchi and Morini, that stopped them from committing what it would take to beat MV and/or the ascending Japanese makers, committed to take over the market, which they eventually did. Great to see a motorcycle centred thread on TNF. I have a stupid question: Why is MV Agusta so often called MV Augusta? Is it simply a typo? I have to admit until recently I thought it was Augusta and that was after following Surtees and Hailwood in period. Am I dislexic, dyslectic, deeslectic, disslexic, dumb? Ok, lets see if there is actually a lot of knowledge about two wheelers on the forum. This one has been bothering me for quiet a while. It is frame of what used to be a 50cc racer in the early 70’s. I guess, only guess, considering the frame construction, that it is early 70’s. At the time there was still a worldchampionship for 50cc. And, just to get it started, a pic of such a little screamer with kreidler power, albeit a bit earlier, probably late 60's (let's say 1969?) with a frame probably built by van veen? Still under construction but featuring the ISTD. There’s a picture of Jacques Ickx, Jackie’s father. In my book, motor racing is motor racing! Great to see a motorcycle centred thread on TNF. I have a stupid question: Why is MV Agusta so often called MV Augusta? For answer, see "Alpha Romeo" and "Farrari". Looks to me like a production Van Veen frame from 1968-69. Kreidler began with their Florett stamped steel sheet-metal frames, introduced the looped tubular frame for the first world championship in 1962 (which they lost to Ernst Degner and the Suzuki RM62) and this evolved into a similar frame to the B&W picture you show. The sad thing being that Kreidler did the same as several companies at the time and crushed the GP bikes at the end of each season, meaning that there are virtually no survivors of these wonderful and exotic machines. By 1967, Kreidler lost their man Hans Anscheidt to the Suzuki works and basically packed up as they were plagued by serious financial trouble. But they had developed an air-cooled "RS" production racer kit for their already potent street moped that had superior performance to many 125cc road bikes, and Dutch importer Van Veen offered a kit of parts to bolt this 15.5HP kit to racier cycle parts. This formed the backbone of Dutch and German entries during the 1967-1973 years behind the works Derbi and Jamathi machines, and of course the Van Veen-entered "works" Kreidlers. I believe that what you have is either one of these production frames or a good copy of it. I saw several bikes such equiped in 1968 when I went to race at the German GP at the Ring. Sadly enough, while you were talking about Tarquinio Provini, of Protar and multiple World Championships fame, he just passed away in his 71. To remember him, what's best than a pic of him in his glory days? OTOH, I join in welcoming a motorcycle racing forum or subforum. As I'm afraid I'm less knowledgeable in this matter than in Alfa Romeo history, I enjoy riding my 1972 Laverda 750SF most. Yet I bought it to, and made friendship with former works pilot Augusto Brettoni, who raced Laverdas in endurance in the late 60s and all over the 70s, including the 1978 Bol d'Or V6 1000. I watched him riding it (carefully) several times in the last years in historic events. I haven't found a Forum on bikes that is comparable to TNF - because there is almost certainly NO forum on any subject comparable! - but I'd certainly like to take part in one. which gives all the results. It is sad indeed to hear of Tarquinio Provini's passing away, apparently from a heart attack. He will always remain in my memory as one of the most courageous men I have ever seen, and the epitoma of stylish riding along with John Surtees. A great racer has left us. Not exactly Motor Cycle Nostalgia but if any readers attend car meetings at Snetterton ,you will probably have seen the "Red Rocket Recovery " Ford Cargo with hiab hoist . The company owner and regular recovery driver is non other than Alex George who was Hondas man for the Isle of Man F1 and senior races in the late '70s and early ,80s. I know even less about bike racing history than the 4 wheeled stuff, so I'm very happy to learn more on TNF. But how does this go down with the management and TNFers who responded negatively to, or ignored, this thread I started a few weeks ago....? I think there is a risk of upsetting the 4 wheel only types, so if it’s possible to have some sort of sub directory forum, I think that would be best. Of course it is Jarno, after whom Jarno Trulli was named. Jarno was one of the greatest before being murdered (there is little other way to put it) by the Italian FIM reps at Monza along with the briliant Renzo Pasolini. A sad loss indeed for all. Note that the bike is a works TZ350 as seen by the aluminum-alloy fairing pan (the customer version had a fiberglass pan). The Finnish importer Arwidson was one of five the "unofficial" works team that year. Please don't leave us hanging like this! What happened? Jarno's death, along with that of Renzo Pasolini at Monza on 20 May 1973 was a great tragedy which appalled the motorcycling world. Rarely has one man received such adulation and achieved so much on the race track in such a short time. Jarno died a hero's death on the race track doing what he always did, riding 10/10ths. But, he didn't want to do die and he died needlessly and in doing so the world lost a larger than life motorcyling celebrity. Jarno rode in 3 race seasons and looking back he seemed invincible and his spectacular riding style was immensely popular. "I want to live to be a very old man" he joked a year before his death. "If I win a world title I will definitely retire." He neither lived to be old nor retired after winning the world title. The 1973 Italian Grand Prix was a farce with tensions running high. The armco fencing was very unpopular even with hay bales. The track had been re-surfaced carelessly. In the 350cc event after Villa's Benelli began losing oil forcing his into the pits. His team encouraged him back onto the track a there was only one more lap to go. He cruised around to finish 5th dropping oil onto the track in the process. A journalist, Christian Lacombe was concerned at the amount of oil visible on the track and approached the marshalls to clean it up. Instead they called the police and threatened him with ejection from the circuit. John Dodds confronted the Clerk of the Course over the condition of the track and was also threatened with the police. John warned as many riders as he could but didn't get to speak with Jarno. 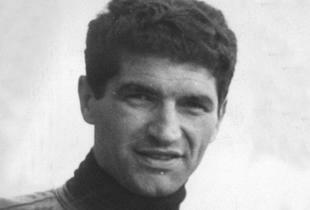 Pasolini also did not know having retired from the 350cc race. It was inconceivable that anyone started the race at all but in those days riders did not have a spokesman and were not used to challenging authority. Disaster struck almost immediately. Pasolini struck the oil in the first corner, the Curva Granda, and fell fatally. Saarinen following closely could not avoid him and also fell. Hideo Kanaya missed the fallen riders but hit the straw bales full on. Another dozen riders were embroiled in the mayhem that resulted, most suffering injuries. The race organisers took another two laps before stopping the event. The shock was total. The Suzuki, MV, Harley and Yamaha factories banded together to fight for better race conditions and Yamaha pulled out of racing for the year. The tragedy saw the end of a racing regime which had not adjusted to changing times. Well, I do not think I need to add much. Christian Lacombe is my friend, and so were Jarno and Renzo. It was an awful day with awful people, but none of them went to jail for any responsibility in this catastrophe. The same Italians have been after Colin Chapman and Patrick Head for how many years now? Depends on who you are I guess. Now, back to the possibility of a two-wheel forum within Nostalgia? Jeez, Bazzer's getting wild outta shape there.......looks like he's about to flip it, but I bet he didn't!!!!! My memory's not too sharp on bike racer's colours, but I'm sure that's Kenny Roberts in the middle, and is that Wil Hartog nearest? [B]I know even less about bike racing history than the 4 wheeled stuff, so I'm very happy to learn more on TNF. But how does this go down with the management and TNFers who responded negatively to, or ignored, this thread I started a few weeks ago....? David, I just checked your thread and agree with you that there is so much in common: didn't most of us start out infatuated with bikes before we became infatuated with cars? Certainly that was true in my case. I would go to the local motorcycle dealer in Guildford and lay along the tank on the Manx Norton that sat in the showroom for ages priced at 99 pounds. NOTHING could be greater in my young mind than having that bike and chasing Hailwood, Hartle etc around the IOM. On my only visit to Brands Hatch I watched transfixed as Owen Greenwood came from dead last to take the lead at the exit of Clearways on the final lap-I was standing right there and for a 14 year old it was very, very special. Greenwood ran a BSA 650 engine that he had to buy piece by piece from the local BSA dealer because the factory wouldn't sell him an engine! So many similarities, we cannot ignore the bikes. My wife says that I have a big hole for a brain and cannot remember my best friend's name, but instead recall the least important of things. So be it, let see if I can be correct this time without resorting to past documents. It's Will Hartog allright, but it is Marco Lucchinelli on the Gallina-Nava Olio Fiat Suzuki in the center and not King Kenny, with Sheene-boy doing wheelies on his privately-entered Yamaha after he left Suzuki, a big mistake as the semi-works Yamaha will not be good to him all year long. This is 1980 and Will Hartog will indeed win the Swedish GP while Jack Middleburg will win in Will's home GP at Assen. Kenny will win the title on the Yamaha-International yellow and white, Kel Carruthers-prepped machine. Note that Graziano Rossi, yes, Valentino's father, will be brilliant on the other Gallina-Nava Olio Fiat Suzuki, after leaving Morbidelli that closed the doors of their racing department. Regarding the photo of Bazzer on the back wheel: It looks like start of the '79 British GP at Silverstone. Sheene is still with Suzuki and no, he didn't flip it. However, Hartog did beat him into Copse. The Olio Fiat Suzuki rider in the middle is Virginio Ferrari. Roberts won from Sheene by about half a bike length with Hartog third and Ferrari fourth. And you're correct T54; Middleburg did win the Dutch TT in '80. Great to see so much bike interest. This is 1980 and Will Hartog will indeed win the Swedish GP . No no no , not at all, zis ees terribly wrong mon cher Philippe T54 ! It is Virginio Ferrari on the Nava Olio Fiat Suzuki , Sheene is on his works Heron Suzuki alright , and it is most probably 1979 ( otherwise, 1978....) and the start of the Silverstone British GP . .....and yes, sorry Don Ludewig, you had beaten me to it , I didn't refresh my browser before replying ! That's me sitting on Barry's 1977 World Championship winning Suzuki RG500 , picture taken in 1997 in Barry's house in Carrara, Gold Coast......and shot by none other than Barry himself , with my camera ! Your accurate knowledge of those days is admirable. What was your position then? Rider, team member, photographer, journalist or simply an ardent spectator? I hadn't heard the full Saarinen/Pasoline story before, mainly as magazines didn't seem to go into such great detail in those days. Now everything is analysed to the Nth degree. Threads or dedicated domain? If that means a completely seperate website, that'd be a shame. Couldn't we have a small section of the Atlas website ) or that what a dedicated domain is?? Welcome David, thanks for the link. I too have an interest in Racing Motorcycles (where is Murray Walker when you need a spokesman!!). My overseas hero was Mike Hailwood and a bunch of locals like Gregg Hansford. When I was just a little tacker, I was introduced to Motorsport at the Sydney Showground Speedway (actually it was an intensive introduction!!). The Solo's and Sidecar's were my favs. "You are correct in recalling the Geoff Duke's Gileras , but these bikes were really not successful except when the prodigee rider from Venezuela, Benedicto Caldarella, drove them, almost humiliating the invincible MV Agusta team and Mike Hailwood in the process." Yes, when Geoff Duke brought the all conquering Gilera to Australia......my Father assures me it was like the second coming!! Tremendous interest created here. I can also see a place for Motorcycles in the their own Nostalgia section....hell there is enough talk about 500cc powered Coopers here already! Your accurate knowledge of those days is admirable. What was your position then? Rider, team member, photographer, journalist or simply an ardent spectator? another link....it's a german site but worth having a look since you will find a lot of information there.